When I'm home, I look through the boxes and folders under my bed, not so much for the joy of rediscovering forgotten keepsakes as for the amusement at seeing what my past self decided merited keeping. What's below — which I found, brought back to Santa Barbara, and scanned — I'd guess went into the box some time in 1992, after my tenth birthday. I'd received Legend of Zelda: A Link to the Past that year, and I can remember opening the gift on the ride home from school that day. It rained, but I busied myself devouring the game's instruction manual. A given: Any time I had a game purchased for me when I was a kid, I'd spend the ride home carefully studying every word of the enclosed booklet, presumably in an effort to increase my appreciation of the game once I got home and inserted the cartridge into whatever Nintendo system I was playing at that point in time. This particular Zelda game — the third in the series and a return to the wonderful gameplay that made the original so good, instead of the odd mishmash of overhead perspective and two-dimensional side-scroller that was the first sequel — included an additional booklet however, and one the likes of which I don't remember getting with any other game. 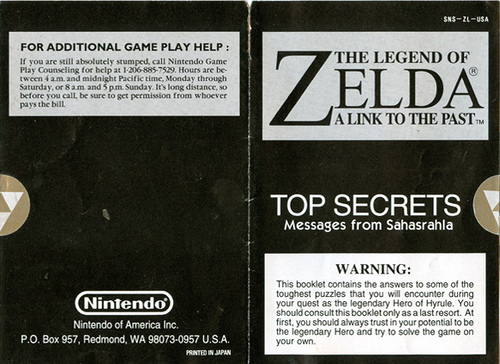 This smaller booklet disclosed the secrets to solving many of the game's many secrets. In the game, the hero, Link, receives advice and direction from an elderly sage with the unwieldy name of Sahasrahla. (Try making the average ten-year-old guess how to pronounce that. It seems simple enough now, but my mind just sorted glided over the name back then, without any regard to how the individual syllables worked together.) Sahasrahla actually doesn't do all that much in person, as I remember, aside from giving Link the speech that characters in each Zelda game give at one point or another: "You're the fated hero, you have to save the world, you don't really have much say in the matter." Sahasrahla also lends Link a pair of magic boots — as should any benevolent sage — and telepathically dispenses hints about the game's many dungeons. What my ten-year-old self apparently found noteworthy about the extra booklet was that it was written as though Mr. S himself were speaking to you. Of course, I didn't know this at the time. Being the honest little adventurer I was, I heeded the warning on the front cover: "This booklet contains the answers to some of the toughest puzzles you will encounter during your quest as the legendary Hero of Hyrule. You should consult this booklet only as a last resort. At first, you should always trust in your potential to be the legendary hero and try to solve the game on your own." I did just that, up until the end anyway, and managed to figure out by myself, for example, that reading the Book of Mudora opens up the Desert Palace and that the apparent maiden in the seventh dungeon is actually Blind the Thief, a big bad in disguise. 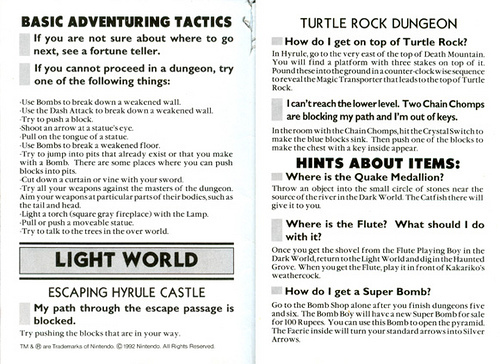 The Turtle Rock dungeon proved more difficult, however, and I eventually tore open the booklet's seal — a round gold sticker bearing the symbol of the Triforce, a triangular design that's been the logo of the Zelda series ever since the first game. I suppose the fact that I left the booklet unopened somewhere safe for so long helped it survive this long. I probably found the answer to whatever puzzle had me stuck and put the booklet back wherever I'd been keeping it. (Or, alternately, I looked up the solution to problem that wasn't in the book, by virtue of being deemed not hard enough. Just my luck, even then.) Whatever the case, this flimsy little booklet has endured. I think this was a clever ploy on Nintendo's part, creating the excitement of having a book of secrets the players aren't meant to open unless under extreme duress and then framing the whole thing in the context of a special message direct from one of the video game's characters. I thought so when I was ten-year-old, anyway. 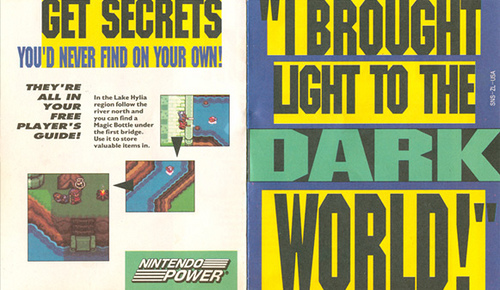 It's an advertisement for yet another means of figuring the game out: Nintendo Power, the official Nintendo magazine. Its preservation still baffles me. At ten years old, I would have been subscriber to the magazine for four years and would have had no reason to keep this. I still think that was the best Zelda game in the series. There was this one area on the path to get Zora's flippers that looked so green and tranquil, I actually just stared at the screen for a good minute or so. sahasrara: the thousand petaled lotus, located over the fontanel. No way! I guess I shouldn’t have assumed that the name came from nowhere. And I often forget to regard Rs and Ls in the names of characters from translated video games suspiciously. There’s a character in Final Fantasy 5 who’s name appeared in the English version as “Krile,” but whose name is more properly pronounced in Japanese as “Kururu” and which I always thought could be anglicized just as easily as “Carol.” I enjoy the ambiguity of it, though. My brother was playing A Link to the Past the other day and he happened to zap a green Chu Chu with Magic Powder. Then, the Chu Chu turned into a really weird creature and said something along the lines of, "My name is Sahasrahla" when Link spoke to him. Does this have any connection? ?